Cosy at Number 3 in Richmond, Yorkshire sleeps 4 people. Cosy at Number 3 in Richmond is perfectly situated close to the market square in Richmond; Cosy at Number 3 is a lovely, quirky, terraced holiday cottage. It is positioned near to the green and a short stroll from the River Swale and a beautiful riverside walk to the other side of the town. From its lovely terraced garden you can enjoy a view of Richmond Castle, a perfect spot to sit and enjoy a glass of wine at the end of the day. The cottage retains all of its original charm and home comforts, and provides a well-equipped place to stay for up to 4 people. 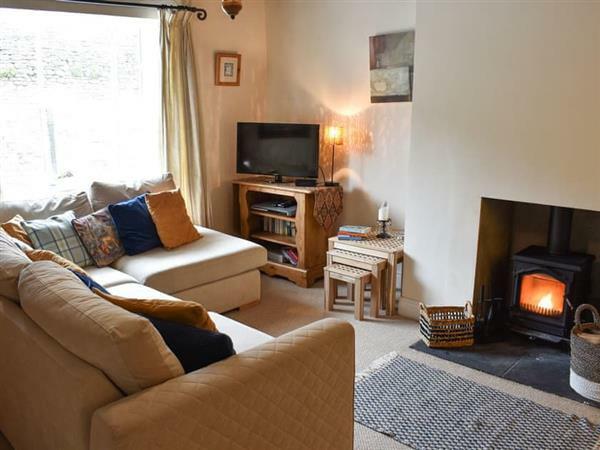 The living room has a comfy sofa and cosy wood burner, ideal for curling up in front of after a day exploring the many attractions Richmond and the Yorkshire Dales National Park have to offer. With flagstone floors and original beams, the kitchen and dining area are located to the rear. There are two bedrooms, one with a wrought iron double bed and feature fireplace, the other has twin beds, beams and overlooks the courtyard and garden. Within walking distance you will find the cobbled market square with a wide selection of cafés, bars and restaurants to choose from. A gallery displaying local artist Lucy Pittaway and a variety of antique and quirky gift shops are well worth a visit. Take a stroll around the Norman Castle or a scenic walk along the banks of the River Swale to the main bridge over the river. Here lies The Station, which has been restored to include a 3-screen cinema, micro-brewery and bar, ice-cream parlour, delicatessen, an artisan bakery and a café with a gallery of local art. Next to The Station there is also a leisure centre. The area is perfect for walkers and cyclists, with many woodland walks and the famous Coast to Coast that pass right through the town and further beyond into the Yorkshire Dales. You will find the shop, pub and restaurant all 500 yards from Cosy at Number 3 in Richmond. Living room: With wood burner, 32 Freeview TV, DVD player and beams. Kitchen/dining room: With electric oven, gas hob, microwave, fridge, washing machine, beams and slate floor. Gas central heating, gas, electricity, bed linen, towels and Wi-Fi included. Initial logs for wood burner included. Welcome pack. Enclosed courtyard with elevated garden, sitting-out area and garden furniture. On road parking; additional public car park. No smoking. Please note: There are 8 steps in the courtyard. There is shared access to the rear of the property. Holidays at Cosy at Number 3 run from Friday to Friday. For a better idea of where Cosy at Number 3 is, you can see Cosy at Number 3 on the map below. Cosy at Number 3 is in North Yorkshire; should you be on the lookout for a special offer, you can find all the special offers in North Yorkshire. It's always worth checking to see what is on offer at the moment. Do you want to holiday near Cosy at Number 3 (UK10411), you can see other cottages within 25 miles of Cosy at Number 3; have a look to find your perfect holiday location.